Walterstown came into this game against Group leaders Ballinabrackey needing a win to avoid the relegation playoffs. They began the game brightly enough and were 2 points to 1 ahead after 10 minutes with the scores coming from Ruairi O Dowd and Alban Crosbie. Then their full forward Kevin Devine scored an excellent individual goal to put them a further goal ahead after 15 minutes. Walterstown then lost their influential centre forward, Ruairi O Dowd, with an ankle injury, which forced them to reshuffle their attack. They also lost their full back Cathal Hennelly to injury after 20 minutes. Ballinabrackey scored 3 unanswered points before Devine passed the ball for corner forward Stephen Davis to flick the ball into the Ballinabrackey net after 24 minutes. However Ballinabrackey fought back quickly with a couple of points and a well taken goal to leave Walterstown only a point ahead. 2 minutes later Ballinabrackey were awarded a controversial penalty which they converted to go 2 points up. Points from Walterstown’s Sam McCabe and Stephen Davis left the score at 2-6 to 2-4 at the interval in favour of Ballinabrackey. In the second half Ballinabrackey were in control for the first 15 minutes and surged into a 2-9 to 2-4 lead. Walterstown looked to have lost their chance but continued to battle hard. The defenders restricted Ballinabrackey to only 1 other point. 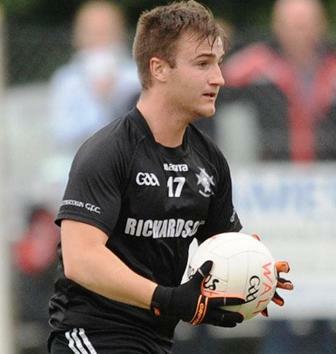 Deputy goal keeper, Ciaran Murphy kicked out well and was called on to make a couple of vital stops. John Geoghegan, Peter Reynolds, Aron McLoughlin and Cathal McGuinness had to be alert against Ballinabrackey’s fast breaking forwards. Conor Cullen deputized well for the injured Cathal Hennelly when he came on. Davy Reynolds just back from injury, together with Alban Crosbie worked hard at mid field. Walterstown forwards were tightly marked by the Ballinabrackey defenders but patiently clawed their way back into the game. In the last 10 minutes Sub Joey Coogan pointed 2 good frees with 2 other points from Mark McCormack and Alban Crosbie. As tension reached fever pitch Walterstown found themselves only 2 points down, deep in injury time. Then with Referee Seamas O Connor glancing at his watch, Walterstown’s half back, Davy Donnellan, found himself with the ball 20 metres out from a packed Ballinabrackey goal mouth. His first attempt was blocked down but his second effort flew into the bottom corner of the net. It was a very relieved Walterstown team and supporters who heard the final whistle blow right after the kick out. They can be forgiven for the scenes of jubilation after the match, as they were within seconds of being in the relegation playoffs. Manager Eoin Carroll with mentors Brendan Murray and Justin McCarthy will be somewhat disappointed with the 2018 season but must be encouraged that their team showed such improvement in the last few weeks. Also it was a year where Walterstown were without some key players due to injury, who hopefully will be available to play again soon.